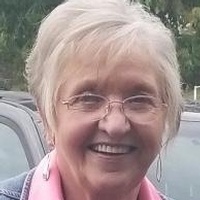 Linda Joyce Ware Sumpter, 74, of Earlington passed away Thursday, Nov. 1, 2018, at her home. She was born June 30, 1944, in Clay to the late Lula and Carl Ware. Linda was employed at Red Wagon Antiques and Animal Medical Center in Madisonville. She enjoyed traveling, spending time with family and had a true compassion for animals. She was a member of Earlington First Christian Church. Linda had a smile that would light up a room and a fun sense of humor. She was admired by her perseverance and determination that never wavered. She will truly be missed by many. In addition to her parents, she was preceded in death by a daughter, Connie Peyton Gibson; four brothers and a sister. Survivors include her husband, Bill Sumpter; a son, Tommy Peyton and wife Kathy of Madisonville; daughters Lannette Howton and husband Greg and Carla Thomas and husband Mike, all of Madisonville; a brother, Danny Ware and wife Lisa of Madisonville and David Ware and wife Sandy of Louisville; sisters Brenda Gunn and husband Danny of Nortonville and Wanda Bryan and Carolyn Loughery, both of Madisonville; granddaughters, Lacy Howton of Nashville and Hillary Lamb and husband Justin of Hanson; a grandson, Brad Peyton and wife Jessica of Hanson; a great-granddaughter, Addison Peyton of Hanson; and several nieces and nephews. The service is 1 p.m. Monday in the chapel of Harris Funeral Home in Madisonville with Pastor Kim Hudson officiating. Burial follows at Concord Cemetery in Manitou. Visitation is from noon to 4 p.m. Sunday and from 11 a.m. until the funeral hour Monday at the funeral home. Pallbearers are Greg Howton, Mike Thomas, Brad Peyton, Gary Peyton, Danny Ware and Tommy Peyton. Honorary pallbearer is David Ware. Memorial contributions may be made in Linda’s memory to Hospice of Western Kentucky or the Hopkins County Humane Society. Condolences may be made to the family at www.harrisfuneralinc.com.